The visa information or the lack of it online can leave you confused, so you can thank me for this firsthand information. If you're an Indian national, you will require a visa (no surprise). There's a $50 fee for visa on arrival that you can pay via your debit/credit card once you disembark the flight at the Zanzibar International Airport. Be nice to the immigration officials - smile, chat and...happy days! While European nationals don't have to get any visa (while I was swiping my card to pay my visa fee, I turned green with envy as my Romanian friend simply walked through immigration...grrr! ), US nationals have to bear a $100 visa on arrival fee (there, there...). Nationals of several African countries and Hong Kong (I wonder why!) have no visa requirements. Zanzibar requires people coming from some countries (with a risk of Yellow Fever) to take the Yellow Fever vaccination. If you're living in U.A.E. - good news; you don't need to get a shot. This vaccination should be done at least two weeks prior to traveling. However, it is recommended to take a shot if you intend on staying in Zanzibar for a long time where you maybe susceptible to mosquitoes. 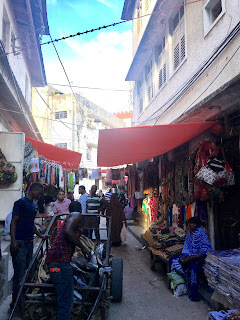 Until about a week prior to traveling, I did not know what the local currency used in Zanzibar was. FYI, it's Tanzanian Shillings (TZS). Silly me, I go with a couple hundred Dirhams to the currency exchange, and realized after making a visit to three different exchanges, that no one keeps TZS. So I bought some US Dollars ($1 = TZS 2236.7). Worry not, because as we found, at the airport, we could exchange our dollars into TZS (feel free to ask for a good rate). However, US dollar is a widely used currency by tourists in Zanzibar and I would recommend keeping a mix of USD and TZS. Menus in restaurants to shopping tags in the markets are in USD. Outside the airport if you would like to exchange currency, ask your hotel/guide to make recommendations. There is a Western Union. ATMs are sparse - I would not recommend you rely on them. Bargain when you shop - many times, the shopkeeper himself will ask you for how much you are willing to pay. 99% of island locals are Muslim and observe the Islamic faith. So while you can flaunt your two pieces on the beach, choose conservative dressing when you are visiting the main town. Being well clothed is also a precautionary way to avoid being bitten by mosquitoes thereby avoiding any malaria scares. A mosquito repellent and sunscreen. Most resorts will have mosquito nets around the bed. Remember this is an island and you will be sharing space with many, many, many other species. The sun is also very strong here and you can tan within minutes of frolicking in the pool. Now, if you have chosen to stay in a beach resort, you're going to be around an hour and a half drive away from the main town. This means accessibility is limited; which means, there are no little stores you can visit to buy supplies. So be well prepared. Carry toiletries (shampoo, toothpaste, et cetera). Pack some snacks with you in case you feel famished between meals. Our beach resort did not have a television or WiFi in the rooms (only the restaurant) and barring the pool and beach there isn't much else to do, so I would recommend you carry an interesting book and a board game or two! 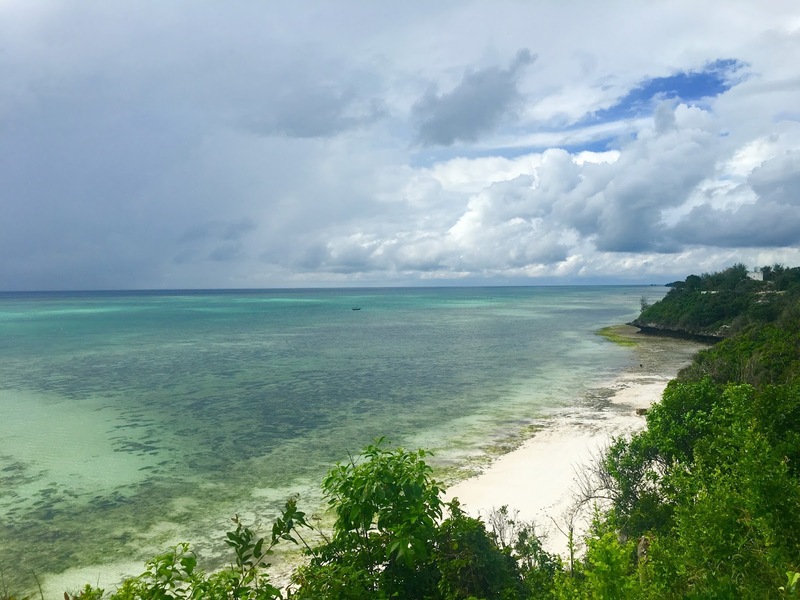 July to September are considered peak tourist season in Zanzibar. I however went in April when it rains. But my worries were misled. Yes it rains, but for only an hour in the morning. Then, the sun is out in full power for the rest of the day, the weather is humid and perfect to catch a deep tan while you enjoy a dip in the pool or a walk along the beach. April was also a good time to visit because the resorts are largely empty (hardly any tourists), so we received fantastic personalized service and attention at the resort; besides you get great stay and flight deals too. We were three girls traveling to Zanzibar and while each of us wanted to have a fun time, we always kept our wits about us. We walked on busy streets, local markets, went on ferry rides, and at one point, we were the only guests at our resort - we did not encounter any incidents that threatened our safety or made us feel scared. We even walked back to our resort for over an hour along the completely isolated Zanzibari coast (we couldn't locate our ferry or the guide). People are kind and concerned, but always have your guard up. However, having done a fair bit of reading online prior to traveling, there have been instances of theft, pick-pocketing and petty crimes scathing tourists on the island. As they say, better be safe than sorry. The locals on the island are poor. Many can afford to only have one meal a day. Electricity and water are not amenities that most homes have access to. Tourism is the major source of income for Zanzibaris. So be a thoughtful tourist: when you bathe, make it a short one and don't indulge - you're using a resource of theirs that they don't have a surplus of. While driving back from the town to our resort at night, we passed many locals walking with a portable emergency light in their hand in the dark on long stretches of road without streetlights, and also passed by many houses lit up by nothing but single bulbs. Leave a generous tip at the resort; it may not buy you much, but will take them a little way along! I'll just lay it out here...vegetarians, good news. There's a lot of options for you on the menu. The local cuisine has influences from India and Arabic countries. Take Urojo soup for instance, it reminded me of a soulful Indian potato curry; and Mchicha which was like my mum's Sindhi spinach dish. Beef lovers, there's enough of that red meat for you here, as is fish and prawns. But many times because of accessibility, not everyday would the kitchen be stocked with the fresh catch of the day. Always wear a seat belt - locals are known for their rash driving. You will also observe how drivers will avoid parking their car under a coconut tree lest a coconut falls crashing down denting the car. Roads are dotted with traffic cops and your driver should always stop. Cops will check with your driver for his driving permit for the day. Be very cautious on night drives as roads are sparely lit and isolated - avoid getting a shut eye if you're sitting next to your driver in the front passenger seat. That's all the wealth of information I have for now. If you have any questions or want any recommendation, please feel free to leave a comment...just because!